Hello. My name is Dawn and I’m a straighten-it-out-aholic. Wherever I go—a doctor’s waiting room, a church pew or a restaurant—I fight the urge to straighten out the piles of magazines, tithing envelopes and menus like it’s a disease. It’s not OCD because I can successfully leave those skewed piles alone, but I don’t like it. Ask my daughter who noticed my madness in her preteen years and challenged me while in the pediatrician’s office, whose end tables had lost the fight with toddlers all day long. “Don’t touch them, Mom,” she chided. “You can do it. 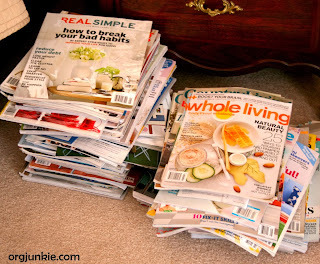 Leave (those magazines) alone.” I ignored them, but my heart raced until the nurse called us into the examining room.